Maryland’s intermediate appellate court held that the owner of a subdivision lot subject to a forest conservation easement was bound by, and the local planning board had the authority to impose sanctions for violation of the easement. Deconstruction (as opposed to demolition) of the former Payne House (10707 Kenilworth) has begun. This is a careful demolition without dozers or wrecking balls, with some recovery and recycling of materials. At its January 9, 2009 meeting, the Town Council appointed the Land Use Task Force and charged the group with examining a wide range of land use issues in Garrett Park. The Council asked the Task Force, chaired by Gene Brantly, to report back with recommendations. 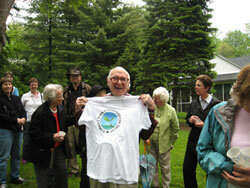 About 30 people gathered on Sunday May 18th in front of the Wilpers home at 10701 Kenilworth to celebrate the gift by the Wilpers family of a conservation easement that will preserve the front and side yards as open space in perpetuity. Although many arrived with umbrellas, the skies cleared about the time the fun began, with the dedication of a tree kindly donated by Dorothy Chrisler, the reading of a poem and the presentation to Mr. Wilpers of the first copy of a T-shirt bearing the GPCTrust logo. 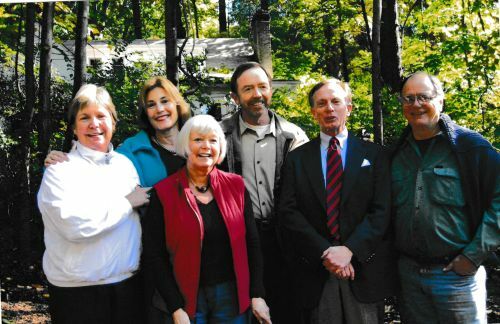 A generous and far-sighted gift by the Wilpers family has preserved the open space on either side of their Kenilworth Avenue home, to remain open forever. This was accomplished through a conservation easement that restricts future development to a limited area at the rear of the existing house. The easement, given to the Garrett Park Conservation Trust, also restricts the amount of non-permeable surface (driveways, sidewalks, etc.) and places restrictions on removal of trees greater than eight inches in diameter. This is the second Garrett Park conservation easement placed with the Trust. "Thank you for coming here to take note of Garrett Park's recent acquisition. I am glad the Town was willing to accept this property and the newly established Garrett Park Conservation Trust ready to oversee its preservation as a natural area. Stephen and I were, and I still am, fortunate to have lived in Garrett Park for over thirty years. We had been delighted to come across a community which was not dedicated to manicured lawns and trimmed hedges. Some of our pleasantest memories were of having our evening meals outside while the wood thrushes sang. It was a happy coincidence that just as I was wondering how this patch of woodlands might continue to be left more or less undisturbed, certain citizens were working to set up a trust that would help to keep the "Park" in Garrett Park. So, to the extent that one can mould the future, may these woods remain in other times than ours a friend to man, a place of enjoyment and recreation. " On August 4, 2006, congress approved a tremendous expansion of the federal tax incentive for conservation easement donations. This is a great victory for conservation! Congress approved the pensions bill with the tax incentives included in the language. The incentives became law when the bill was signed by the President on Aug 17, 2006. * Extends the carry-forward period for a donor to take tax deductions for a voluntary conservation agreement from 5 to 15 years. On March 19, 2007, Congressmen Mike Thompson (D-CA) and Dave Camp (R-MI) introduced legislation to make the expanded tax incentive for conservation easement donations permanent. This bill parallels similar Senate legislation, S. 469, introduced on January 31st. For more information go to Land Trust Alliance. A Creative way to prevent demolition. Several neighbors of Bethesda recently pooled resources to purchase and remodel a nearby home that was threatened by demolition and replacement with a towering mansion. This enabled them to control the design and height of the modified structure. The complete story can be found in The Gazette. Wouldn't it be fun to try this in Garrett Park? We could prove the point that building big is not the only way to get rich; elegance is a viable alternative. Good news! The southern half of a vacant lot on the spacious grounds of the late Robert and Barbara Frost (10915 Montrose Ave) has been sold to neighbors to the south. Since the neighbors have recently completed an addition on the back of their house, the newly aquired space is likely to remain open. The remaining half of the Frost side-lot stays with the original Chevy house, which is on the list of historic houses in Garrett Park, a designation that limits the modifications that can be made. With luck, any additions by future owners would also be to the rear, preserving the facade and leaving the large attractive space between the two houses forever open. Robert Frost grew up in that house, founded the Green Gardens landscaping company which operated out of his yard for many years. Green Gardens trucks are still loaned to the town for use in our annual 4th of July parade. A large wooded lot adjacent to 11018 Kenilworth has been replaced with two essentially large houses. Much of the ground in front of and between them has been replaced with vast expanses of asphalt. A small red cottage at 11311 Kenilworth, adjacent to the Yeandle property, has been demolished and replaced with a much larger house. A small brick house at 10806 Montrose has been demolished and replaced with two much larger houses, one on the side lot and one in the location of the original house. A small frame bungalo at 11306 Rokeby has been demolished and replaced with a much taller one. See our growing gallery of "before and after" pictures.